"The victorious and the defeated...I assume you know which of these is the more fantastic?" "Look well, Teru. This is the defeated." Drama Biography: Satomi is Teru's private tutor, as well as his mentor in Vanguard. Although not a major character upon his introduction, he is the drama's primary antagonist. Maintaining this role even in defeat, he is responsible for motivating Teru to bully and look down on other cardfighters. Spoiler warning: Spoilers for the STAND UP! Vanguard live-action drama follow. Initially shown giving Teru a lesson in cardfight, Satomi espouses his theory of victory; that among the world population between the victorious and the defeated, those who are always victorious are superior to any who think they can afford loss. He passes this idea onto Teru Socratically, asking leading questions that bring Teru to the same conclusion. Their lesson however, is interrupted by Daigo, seeking a revenge match with Teru. Satomi does not allow this. Introducing himself as a genius who first presented his theory of the universe while working for NASA, he cardfights Daigo in Teru's place. Having defeated him in two successive matches, Satomi makes Daigo beg for another chance. Bored by the fight, he dismisses Daigo and returns to his lessons with Teru. Satomi is next seen the night before a local tournament, giving Teru extra study material. Asking the boy to "picture it," he uses Kurumalord's megablast to end their game. Satomi's "image" of Kuramalord's Ninjitsu Art: Meteor Storm. The following day he and Teru participate in the local tournament on Team Teru. Alongside his prodigy student, Satomi is their primary fighter in the opening round, up until the finals where he plays second. Ultimately Satomi undergoes a complete breakdown after his defeat by Daigo, after which he is not seen again. As Daigo's counterpart, Satomi occasionally makes use of his own catch phrase, "Ya know?" spoken in English. 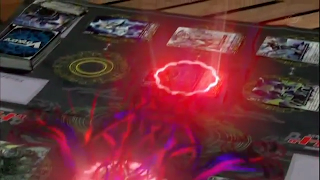 Satomi fights with a Murakumo deck, making extensive use of hit-and-run tactics to rapidly fill his field while saving his hand up to become a stonewall against his opponent's attacks. Because of this, decks without heavy power gain have difficulty dealing damage to him later in the game. Satomi's primary strategy builds his soul with Kurama Lord, bringing out the fiend's megablast for three additional attacks. Against Daigo and many other competitors at their local tournament he rides Dueling Dragon, ZANBAKU, locking opponents out of crossriding.